Osteoarthritis is the most common chronic joint disease that effects quality of life and daily function. It is a deterioration of the joints, causing inflammation, pain, and restricted range of motion. Treatment will not reverse osteoarthritis but can slow down the process and improve the symptoms associated with it. 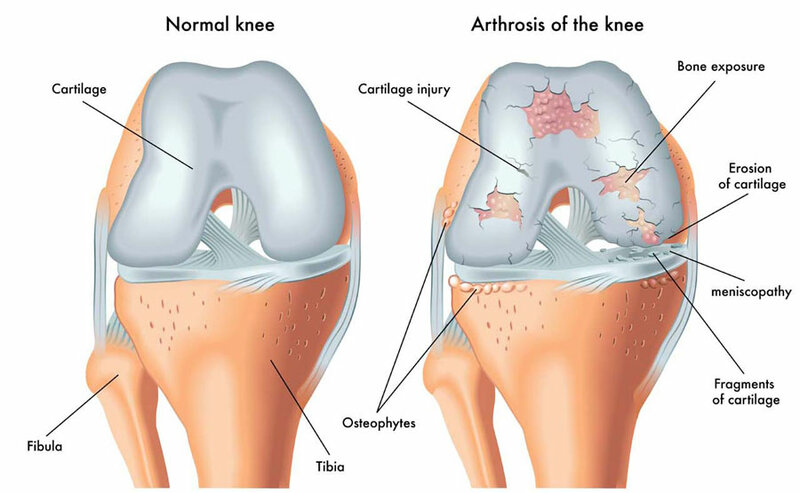 Osteoarthritis is the most common type of joint disease. It occurs due to “wear and tear” – the cartilage in the joints breakdown. OA can happen in any joint but usually occurs in hands, knees, hips and spine. The disease can worsen overtime but treatment can help reduce symptoms. Joint pain that is described as a deep ache, and is not always felt at the joint; for example, OA of hip pain sometimes is in the groin region and goes to the thigh. Pain usually occurs with use of the joint and is relieved with rest. There may be stiffness with initial use of joint, such as in the morning, but it usually resolves within 30 minutes of rising. Bones can swell due to excess fluid in the joint. Cracking sensation can be felt at joints. Bony outgrowths can be felt under the skin and become larger over time. Joint pain results from the movement of one joint against another because there is loss of cartilage; cartilage is a rubber like padding that covers and helps protects ends of bones at the joints. Research indicatesthat swelling/inflammation occurs in the joints to help repair the cartilage damage. Age, – 80% of people with the disease are over age 55. Obesity- additional pressure is put on hips and knees; this causes the cartilage to break down faster. Occupation – job that require frequently putting weight on joints such as knees can affect development (athletes, etc). Morning stiffness < 30 minutes. Clinical diagnosis of OA can be supported by radiographs, showing bone outgrowths, joint space narrowing, and other deformities. Additional lab testing can be ordered to see markers of inflammation such as ESR or CRP; these markers are normal in OA and can rule out other causes of joint pain. Joint fluid analysis can also help exclude other conditions such as inflammatory arthritis, or infection. Goal of therapy for patients with osteoarthritis is to control the pain, swelling, and improve quality of life. Non-pharmacological therapy includes: exercise programs, weight loss counseling, and education. Physical therapy can be beneficial because it is important to maintain muscle strength and to help identify factors that are contributing to an increase in the rate of this wear and tear. Swimming is an ideal exercise because there is minimal pressure on joints. Initial treatment of non-inflammatory OA should be with acetaminophen on an as needed basis, and can be used 3-4x daily (1000mg every six hours).Acetaminophen effects the liver, so car must be taken when ingested with other products that also are processed similarly, like alcohol. If inflammatory OA is present or acetaminophen is not helping – use NSAIDS. Start on low dose on as needed basis. Side effects include: rash, abdominal pain, kidney or liver worsening, interference with aspirin. If patients cannot tolerate medications by mouth, or are at increased risk from side effects with use (age >75), body cream composites with NSAIDS or capsaicin are used as alternative. If NSAIDS and Tylenol do not help, use of joint injections with glucocorticoid (steroids) are useful.Patients may have 3 months of pain relief with each injection. Surgery is considered for patients with serious disability. Total joint replacement can be performed if patients fail conservative therapy. Refer to Dr. Chahal’s video on total joint replacement for further information by clicking here. Prognosis for patients with OA depends on the joint involved. Patients who have bilateral knee OA have faster rate of deterioration than patients who have fewer joints involved. Patients who have multiple medical conditions (heart and lung) are at greater risk of developing lower extremity disability than those with knee arthritis alone. Medication does not prevent progression of OA but can help the patient’s quality of life by controlling the pain. Physiotherapy can help identify and modify the activities that hard on joints and can reduce the symptoms associated with osteoarthritis.